We frequently come across the notion of the artificial intelligence and witness the way our smartphones become even “smarter”. We also have got used to the word combination “connectionist network”. The atmosphere of the modern technological world keeps teaching us that appliances and devices will become smarter in future and we will be able to rely on the decisions they make in different niches. Would you like to see a service that will be able to create a successful website in the automatic mode by using the data provided? There is a certain algorithm, which analyzes the submitted information, correlates it to the databases, compares separate details, looks for extra information, defines the most effective website layout design based on certain criteria and displays the result. Sounds great, doesn’t it? You just need to answer a few questions, wait for a couple of minutes and get something you won’t be embarrassed to publish on the web and invite clients to visit your website. Such website builders already exist! Some of them are already in the testing mode, while others are already available online. Yes, it is too early to speak about the intangible supersanity and brilliant results. However, the idea is alluring, it was realized and the development continues in a pretty nice tempo. Artificial intelligence is the modeling of intelligent behaviour based on the connectionist network principles that functions as a nervous system of biological organisms. There are multiple small interconnected clusters that work on the completion of a certain assignment. The system gradually gets educated (which is the major feature of a real AI), accumulates information and ways of its interpretation, compares final results. Thus, in 2-3 years, we may witness the situation, when the available AI website builders will quickly and effectively create the websites we need. As of today, the artificial intelligence of website builders is on the initial stage of its development. Work with such systems resembles the completion of a test, in which you choose the direction the result will adhere to depending upon your answers. What is your favorite color? – Green. And you watch the way the automatically created website highlights the most important elements with a pleasant green color. Is this magic? Surely, not. You’ll feel the magic, when a website builder will ask you a question like “Provide 3 links to the websites from the niche you prefer”. Right after you do that, the system applies its complex analysis process and generates the wow-result. This is AI and the entire web building industry is on the way to it. The AI trend is gaining popularity. Many users tend to apply the options of these smart tools in their systems, because the future is about the comfort and money they offer. It goes without saying that AI won’t be able to create complex websites. This is a creative work, which is the humanity remit. At the same time, they will easily cope with business websites, portfolios, promo websites and landing page templates. These are the simplest from the technical point of view and the most popular variants. AI has the unlimited perspectives in the creation of these types of websites. If we currently review website builders from the point of view of ease of use for newbies and quality of the ready made result, then simplicity and convenience won’t eventually matter a lot. This is because any user will be able to activate the button and get the required result. As of today, there are various niche systems, which come with AI mode used as a virtual website creation assistant. There are even systems, which are promoted exclusively as AI website builders. Generally, there is no big difference in the way both system types work, but when it comes to the details, though, the approaches differ. When launching websites, each service is based on the options of its editor (widgets, blocks, styles). That is why, the difference in the results exists. Let’s review Wix ADI, Bookmark, Jimdo Dolphin, The Grid and Firedrop as the samples of active services and characterize each of them in details. When it comes to the creation of a new project, Wix will provide an option: you may launch it with a template or by means of the Artificial Design Intelligence. If you decide to select AI, you will be offered a set of questions, the answers to which will be used as a basis for the development of your website template: type of website you need, a set of required features (website type, functionality), business name, its physical location, contact data (social networks, email, phone, fax, logo). Then you will be offered to choose one of several styles. Having completed the preliminary stages, you will see a button, which is used to create a website. In around 30 seconds, you will get a ready made template and a list of instructions on its further use. You can quickly edit a block or proceed to the full-featured Wix editor version. The result you will avail when using the ADI, can be considered a nice one. Obviously, you should manually add the content to the website and edit the demo data. When working with Wix ADI, you basically get a template in the preferred style to match your niche. Website structure is defined with regard to the niche and a set of functional elements. You can change the styles of separate blocks and edit their content on the go. Generally, you get a quality basis for further detalization of the project image, be it a business website, a portfolio, a blog or an eCommerce website. You can use the templates without any improvements – they look nice as they are. What matters most is content quality. See also: Wix and Wix ADI complete review. 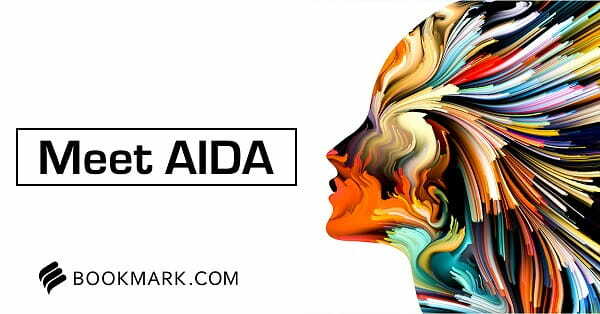 Get ready to meet AiDA – the female image, which is the embodiment of Bookmark AI. AIDA acronym stands for artificial intelligence design assistant. The service is a nice website builder with a visual editor and, thus, it comes with a technical base needed to create quality websites. The process of working with AI: you’ll need to answer a couple of questions, select the layout, style preferences and then AiDA will use the data to generate your website in around 30 seconds. Right after that, you will be redirected to the editor, where AI will add beautiful animations in the real time mode along with functional blocks to the website pages. It looks impressive, rich and modern. • Cost – free to $24.99/mo. After the introductory presentation, you’ll keep working in the manual mode, using standard design editing tools. AIDA will continue to support you with the most important steps to further customize your website. This is done by using the wizard in the lower right corner, which comes with automated tutorials where AIDA will shows you how to do each process. For example, how to change colours, fonts and sections. This wizard really helps with speeding up the learning curve so that you don’t have to do searches in the how to guides. Bookmark has ambitious plans for it’s AI website builder. The premise behind Bookmark is that AIDA creates high user engagement websites specific to your business type. In the near future Bookmark will give suggestions on how to further improve your website to achieve the goals you want. Also, Bookmark will be adding GAN AI technology which will create computer generated images and text. Bookmark will be interesting company to watch in the years ahead. We recommend Bookmark as an attractive website builder with technology that is paving the way into the future with AI. See also: Bookmark complete review. Jimdo Dolphin interface is presented as AI chat, where a user is asked a sequence of questions, namely business name, niche, social network accounts, logo selection etc. What’s interesting, you won’t be asked about the preferred design. The system is responsible for the choice of the color palette and other suchlike nuances. This is good. The approach is explained by the fact that Dolphin performs the online search of your company by its name and then offers to confirm the choice of your business among the available variants. AI then analyzes the information and individually selects the style of your future template. This is more interesting. • Cost – free to $19/mo. The result of working with Dolphin is pretty remarkable. You can get your company website (small business) or a landing page almost in the final variant. What matters most is that Dolphin uses a separate editor and even the pricing policy of the classic Jimdo version. This reveals serious intentions of the system developers: we deal not with the AI-like add-on, but with a brand new branch of a popular website builder. Dolphin editor allows adding blocks of various functionality and choosing suitable templates among a dozen of variants. As a result, you can quickly correct or add those things a local AI overlooked in your opinion. The entire working process comes with visually appealing animations, which add novelty and freshness to the service. Generally, Dolphin copes with its task – creation of structurally simple websites with modern design and stunning content presentation – pretty well. This is a perfect alternative to the standard Jimdo Creator for newbies. Blog and eCommerce development options will, probably, be added in future. See also: Complete Jimdo Dolphin review. The service is presented as the clear AI website builder. It doesn’t have a trial version and is available only via subscription. Molly – this is the name of the virtual designer of the service. You need to create each page separately. The interface is strange and it looks somewhat extravagant – enormous elements, large blocks with thick frames, specific demo images and dark background. Frankly speaking, it looks affraying rather than user-friendly. It’s quite difficult to notice any smart actions from the system. You need to make the settings manually – there is no automatic mode here. It seems like we deal with an inconvenient editor, but not with the AI variation. It is you, who is responsible for your website development and you have to be consistent, when setting up the design of elements. Only in this case, Molly will generate and display the result. The service was launched in 2014 and triggered serious expectations. However, there is no AI here. Instead, there is the algorithm of actions, which is quite inconvenient and ineffective. It is you, who does the major work. The service is unsuccessful from all the points of view as it roughly fails in terms of the working process and final result. The website builder is presented as the AI solution, which is a standard editor with a set of widgets. There are no settings here. The interface is interesting and a bit futuristic, which completely matches the notion of the AI solution. The virtual assistant named Sacha communicates with you via a chat. He asks questions, the answers to which result in the generation of the required website design. There are also links for quick access to the editor’s feature set in the lower part of the chat. This is where you can choose the template style, font scheme, add new sections etc. Generally, Firedrop seems to be a pleasant service, the feature set of which is provided in the interesting dialogue with Sacha – the local AI version. You don’t have to look, what to add to the website and where to do that. You just need to define the niche you are interested in and the assistant will provide a link to the most suitable variant. You can add the sections manually, filling them with content in a simple and convenient editor. The assistant actually acts as an information center and provides help in the selection of style, header image, name and other suchlike elements. Firedrop is basically a standard website builder with a pleasant interface and medium feature set. The attempts to create a feeling of automatization of the system result in the inability of a user to complete a lot of standard actions. The system tries to highlight the important role of Sacha in the process of your website creation, minimizing the number of your actions in the editor. However, a simple algorithm works as a thematic chatbot, answering the questions related to the context of the task – not more. Manual website design customization options are limited and the system cannot generate an interesting result automatically. Generally, this is nice, but useless. It is currently complicated to consider the AI feature of website builders impressive. However, there’s a good start for the development of the tool. What we have today is the systems, which create templates by using their editing tools based on the information provided. That’s not bad, the quality of the result mostly depends upon the power of a platform – a set of widgets, structure, template design etc. You will get a result typical for the selected platform, considering the individual data. Thus, it is more about the algorithms, which work in the initially defined frames. They just initiate and complete the sequence of actions. Right after a standard set of questions, you will be redirected to the specialized and simplified version of the editor. Thus, ADI stands apart from the major feature set of the platform. This is not just a trendy preview in the AI style format, but a new individual branch of Wix functionality. Individual interface, new blocks, wizard with tips and links for quick access to functionality sections – these elements will keep developing. The same is about the template formation algorithm and the result management environment. This website editor stands out against Jimdo due to the opportunity to edit blog and online store settings. Wix is an advanced website builder, which looks professional as compared to its competitors. It is not about AI perspectives only – a user gets the best technical base for a website. Let’s face it, it doesn’t make any sense to analyze AI apart from the feature set of the website builder as any website will still be created by means of using web design customization tools of the local editor. Wix excels at this. Bookmark is a powerful website builder, its AI tool comes up to that very level required to think about the perspective nature of the tool. He we can say that Bookmark shows us the future of website building. Jimdo Dolphin has also been presented to the advantage. This service tries looking for the company-related info in the social networks and Google search by the business name and then analyzes the variant you have chosen. This is not that very feature that can impress you. However, this is the most distinctive attempt to analyze information, which doesn’t include the details specified by a user. Jimdo Dolphin developers have included the AI feature set into a separate editor and even into a separate pricing policy branch. As of today, the list of leaders is clear: these are ADI, Dolphin and the rest of the services. They really work well, they are perspective and they are useful for newbies. The Grid is a weird solution, which can hardly be used on practice. Firedrop is an appealing service you can explore for your general development. What’s the conclusion then? We are likely to get full-featured AI services from the leading niche developers of website builders in around 2-3 years. These systems will look for information, analyze it, make the forecast and keep participating in the website development process even after its publication. Databases, servers, self-teaching systems with complex connectionist networks. Smart managers, generative design, advanced automatic marketing – these features will come in due time. The start has already been made. Today, we witness the birth of the trend. Some web developers imitate it, while others really try their best effort to create a brand new useful technology.